The final issue of Ghost Prison was a really great read. We knew that Vader would return to Coruscant with the Emperor and sure we knew that Gentis would get his arse kicked. We just didn’t know how. 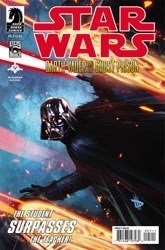 Great story overall – was fun to see how Vader dealt with the Ghost Prisoner in the end…perhaps a bit brutal and merciless but hey ..that’s Vader! !